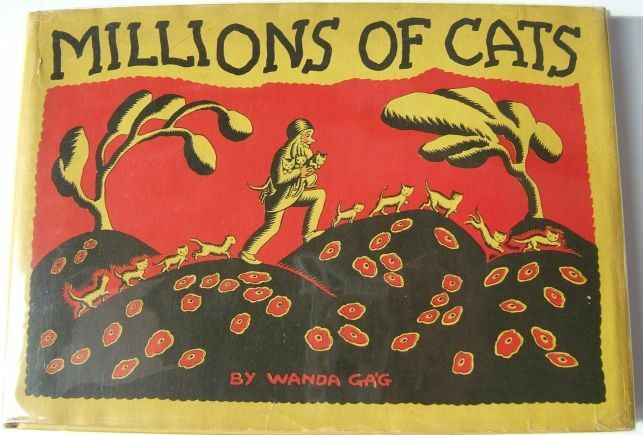 Millions Of Cats; written and Illustrated by Wanda Gág; Coward-McCann, 1928. — Rose Dobbs, Horn Book Magazine, Nov – Dec 1935. 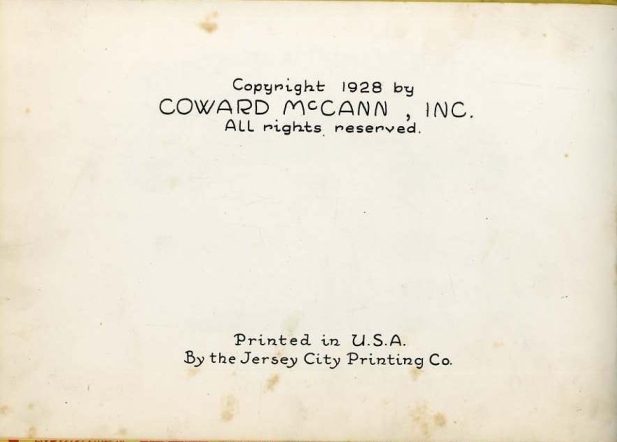 By the Jersey City Printing Co.
Later printings omitted the last line with the Jersey City Printing Co.
Front and back dust jacket flaps are blank (white). 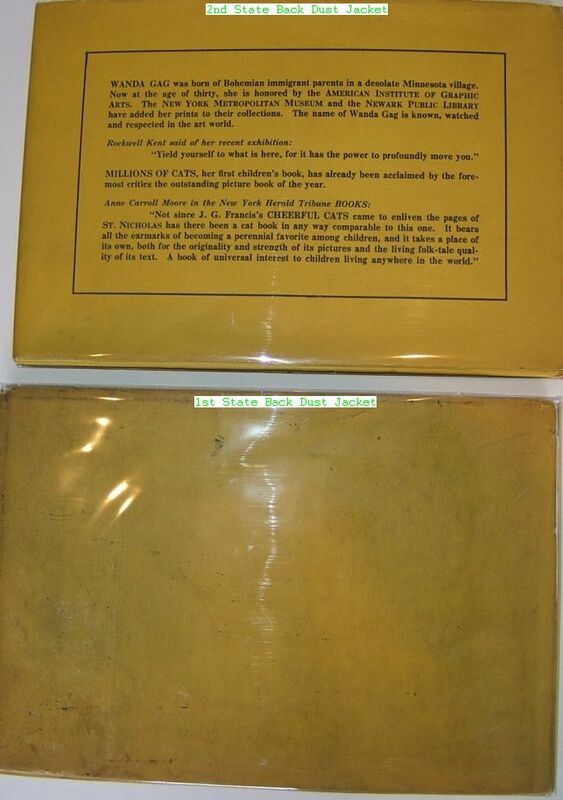 The back dust jacket is blank on the first printing (yellow). A similar back DJ composition was used on both the first printing of Wanda Gág’s The Funny Thing (1929) and Snippy And Snappy (1931). There are a couple of subtle differences. Wanda’s last name is “ Gag ” on the back DJ of the second state Millions Of Cats, whereas it is changed to “ Ga’g ” on the latter two books. Presumably it was not possible to typeset an “ á ” in 1928. 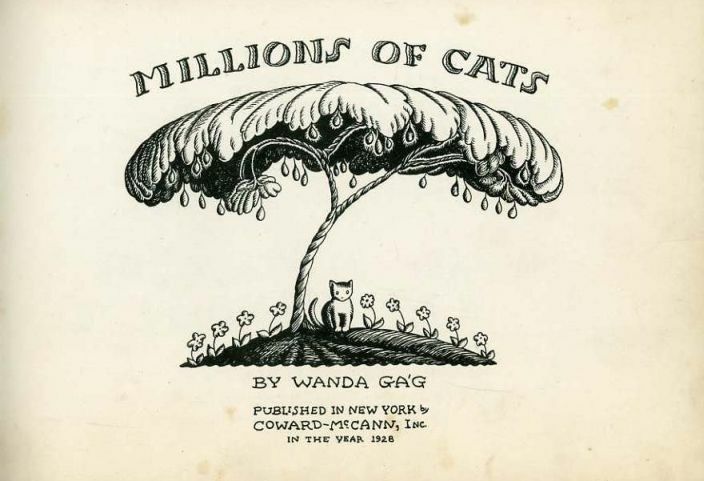 Also, Wanda “was born … in a desolate Minnesota village” on the back DJ of Millions Of Cats, while she “was born … in a small Minnesota town” on the back of the latter two. Apparently New Ulm, Minnesota went through an economic transformation from 1928 to 1929, changing from a desolate village into a thriving small town. The historical importance of the book is underappreciated by the general public, however not so within the bibliophile hobby, as the steep market value will attest. The book is still in print today, which is quite remarkable for a children’s picturebook. How many other picturebooks from the 1920’s are still in print today? If one had to sum up Millions of Cats, pictures and text, in a very few words, form and character would suffice. Form and character fused, yielding folk quality much remarked in Gág’s work. Not only did words and pictures reinforce one another, both benefited by the hand-lettered text: “A child will almost feel that he has made the book”. We also own the slipcased, limited edition first printing copy, which is signed and numbered, and came with a Wanda Gág etching. The copyright page includes the “Jersey City Printing” line. This edition was not issued with a dust jacket.